Over Spring Break my family decided to take our dogs and visit Pacific Grove for a few days. I love Pacific Grove! The weather is nice, it is right by the sea and the Monterey Bay Aquarium, and most importantly, Pacific Grove has great food! One night we decided to go to Il Vecchio, and it was one of the best decisions we have ever made. 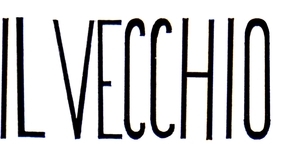 When walking through the door I saw a little chalkboard sign saying “Il Vecchio House Rules:”. These three simple rules are “It’s okay to start eating the moment your food arrives”, “If your food is not perfect let us know…IMMEDIATLEY”, and “CELEBRATE!”. My mom pointed out a larger chalkboard wall around the door. Written on it were cool trivia-like facts like, “All the paintings were painted in Queens, New York.”, “The chairs were collected from all around the country. Three of them were built in 1840.”, and “I built the tables out of salvaged oak wood flooring from Brooklyn, New York.”. When we sat down I looked around at the chairs that were mentioned on the board. I couldn’t find one that had a twin; each was unique and a little different from the other. Some had cushions attached to them, some had round backs, and others had square ones. Everything looked like it has been recycled from something; the tables, the windows, even the lights. The place looked so different, interesting, and so cool! Every time I looked around the room I noticed something that I hadn’t noticed the previous times. There was a cute little bar with paintings on a white painted brick wall. Near it was a stone hearth that wasn’t lit, I assume due to a table being right in front of it. When I looked at the hearth again I noticed a mantle with a line of old looking books on it. It reminded me of a cozy living room. I also noticed an opening that allowed me to see a little bit of the kitchen. Above it was an old clock and to the left was a cool map of Italy. As I sat down I could just hear what sounded like a guitar playing an Italian tune. The whole place felt comforting and homey. Our server brought us bread with olive oil and balsamic to dip. 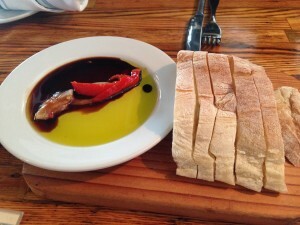 The bread was warm and soft and the olive oil and balsamic had a cool twist. It came on a small plate with the oil and balsamic separated by a little wall of cut red bell pepper. I could taste a little bit of the sweet flavor from the peppers, which went wonderfully with the balsamic. There were so many amazing choices to choose from. I went with the pesce pesto: wild rock cod, white wine, garlic, pesto, fresh spinach, and sautéed vegetables. The light, flakey fish was completely smothered in smooth, creamy pesto. My mom had the gnocchi with tomato and basil sauce. It was the best, lightest, fluffiest gnocchi we have ever had! My brother tried it and absolutely loved it! It seemed to almost melt in my mouth. There was a little olive oil in the tomato sauce and the parmesan sprinkled on top melts a little on the warm potato pillows. The dish was decorated with little bits of basil. The owner came by and talked to us. He explained how to make the gnocchi. He told us to bake 3 large russet potatoes. When half cooled peel the skins off. Using a ricer, smash all the potato. Put in 2 eggs and a pinch of salt, then enough flower to make a ball that isn’t sticky. Then roll out a rope and cut pieces every 2 inches. Press the pieces into a ball and put a thumbprint in each one. Then put them in boiling water until they float, wait 10 seconds, and pull them out. He recommended serving them with butter and olive oil. There were so many delicious choices for dessert. Of course my brother picked his favorite dessert, Tiramisu. “When it arrived, it looked cute but not like it will be super decadent…Then you dip a spoon in and find layers of rich creamy flavor”, said my mom. We could taste the flavor of the rum it was made with and I thought it was nice, not too heavy, and creamy. It was hard for me to decide, but I decided to try the cannoli. The owner came by again and he told me “Don’t use a fork to cut it, pick it up like a hotdog. You can use a fork if you want, I won’t fault you for it. But if it breaks I might laugh at you.”. The cannoli was decorated with what tasted like flakes of dark chocolate and some cocoa and a little sprinkle of powdered sugar. The shell was so light and crispy. The shell was delicate and I followed the owner’s advice to be careful not to break the light shell as you pick it up to eat. The filling was so fresh and smooth and had a hint of orange flavor. It wasn’t gritty at all like some cannoli’s can be. My parents shared the Mascarpone Ricotta Cheesecake special. The cheesecake had 2 creamy layers and was rich but not overly so. My dad said his favorite part was the crust, which was very sweet and dense. We loved the place so much that we decided to go again the next night. I had fallen in love with the gnocchi and so had my brother. We both ordered it with the tomato basil sauce. My dad got the vegan soup with leeks and potatoes. I thought it was nice that there was a vegan option available. My dad said that it had good flavor, and that he didn’t miss the cream at all. My mom got the penne al forno. The whole thing was baked in a skillet with all the pasta and cheeses mixed in. There were crispy bits of baked cheese on top with creamy gooey cheese underneath. The whole thing had flakes of basil and parmesan cheese sprinkled over it. My parents shared a side of broccoli. “Best side of broccoli I’ve ever had”, my dad said. There was just a little bit of olive oil and garlic and he loved that it was grilled. 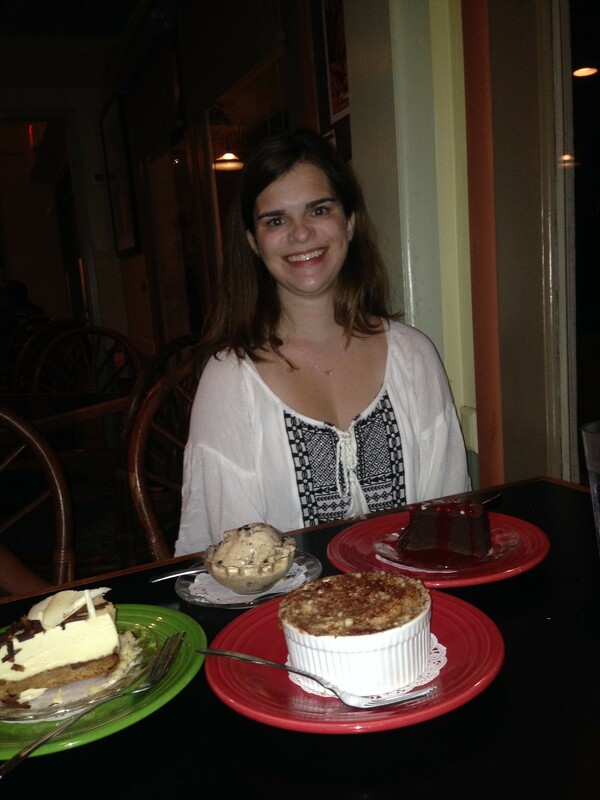 Of course we all had to get the same incredible desserts we got the night before. My mom and brother each got their own tiramisu, my dad got the cheesecake again and I had another one of the fresh, light cannoli. The owner remembered us from last night and asked us if we remembered the gnocchi recipe. My dad had memorized it word for word and recited it. Il Vecchio is very comfortable, nice, and homey. They make amazing comfort food and I love how creamy and fresh everything tastes! It is a wonderful place to take family, friends, and loved ones to have a wonderful, fun, and delicious meal. Click picture to link to their website. 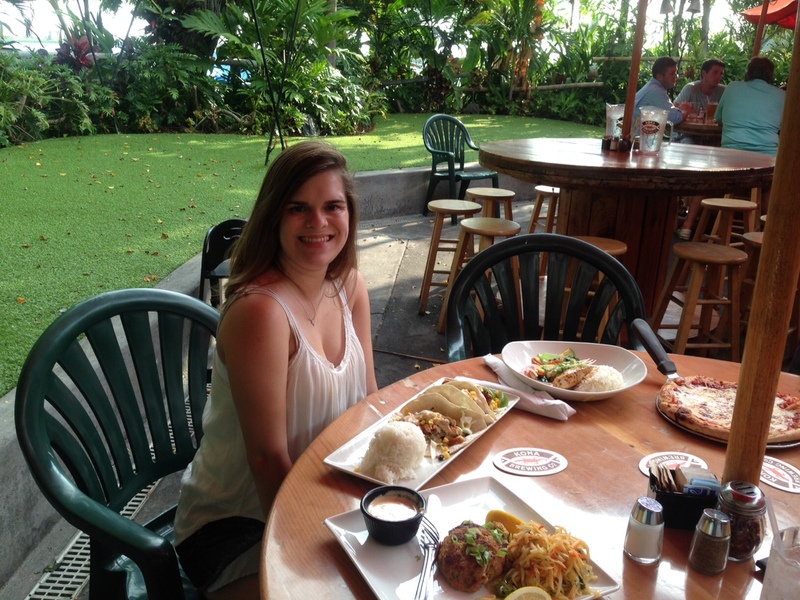 For a great meal in Kawaihae, on the Big Island, Cafe Pesto is a great choice. The atmosphere is very nice with lots of beautiful paintings. The menus has many options including appetizers, pastas, fish, and salads. We decided to start off with the Shrimp Half Moon Nachos. It came with six crispy Asian style chips with a shrimp on each, and a pile of salsa, and cilantro sour cream in the middle. The crispy chips with the shrimp, cilantro cream, and slightly spicy salsa created a wonderful combination of different flavors and textures. The also brought bread to the table and it was served with pesto butter. It was delicious. I am a big fan of shrimp and a fan of pasta, so the Shrimp Scampi looked very appealing. The small portion was the perfect size for this dish. (Many dishes here offer a smaller or larger portion). The sauce was buttery and had just the right amount of garlic. 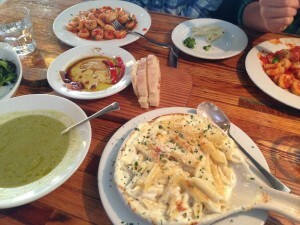 It went very well with the several large pieces of shrimp and the penne pasta. I tasted my mom’s Mahimahi fish special. I was in love with the fish, which sat on a little bed of jasmine rice and fresh veggies. It was cooked perfectly and seemed to melt in my mouth. I would love to taste it again soon! Of course my brother had to get his favorite, the cheese pizza. He loved the pizza and its light, crispy crust. My dad also got a pizza, the Chili Grilled Shrimp Pizza. It had a piece of shrimp on each piece over cilantro crème fraîche, shiitake mushrooms and green onions. He also asked for a side of garlic mashed potatoes (one of his favorite things) and they had a wonderful rosemary flavor with whole pieces of roasted garlic. The Ganâche, Cookies and Cream Cheesecake, and the Hot Keanakolu Apple Crisp. I would recommend getting a reservation. Over all the restaurant was wonderful and the food was fantastic! This is a must go to place for dinner on the Big Island. The shave ice was creamy and cold! Best shave ice on the Big Island in my opinion is Scandinavian Shave Ice on Ali’i Dr. in Kona. We have tried other shave ice places and none are as good as Scandinavian. There’s a huge amount of different flavors, ranging anywhere from the classic Blue Hawaii to Wedding Cake. A few other flavors include Rootbeer, Cherry Coke, Dreamsicle, Red Velvet Cake, and Butterscotch. There are also quite a few topping choices like Mini Mochi and Boba pearls or Popping pearls. You can also have ice cream in the middle. And you can’t have a Hawaiian shave ice without the famous Snow Cap, which is made from condensed milk. The Snow Cap was poured in pretty designs around the whole dome of shave ice. The shave ice itself is flawless and creamy, no chunky ice at all. But they don’t have just shave ice, you can also get ice cream, smoothies, and even a little brownie sundae. The service was super friendly and it’s fun to chat with them about favorite beaches. 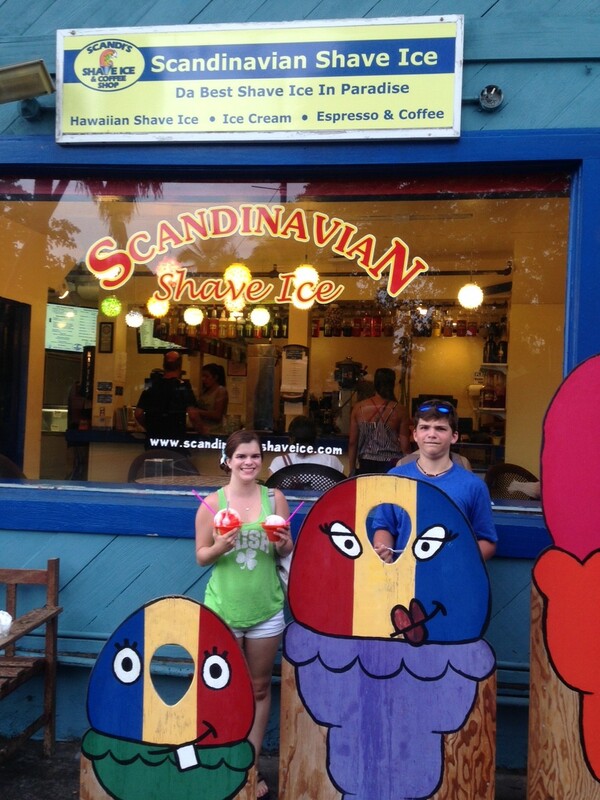 I would definitely recommend Scandinavian Shave Ice to anyone on the Big Island. It’s the best on the island. 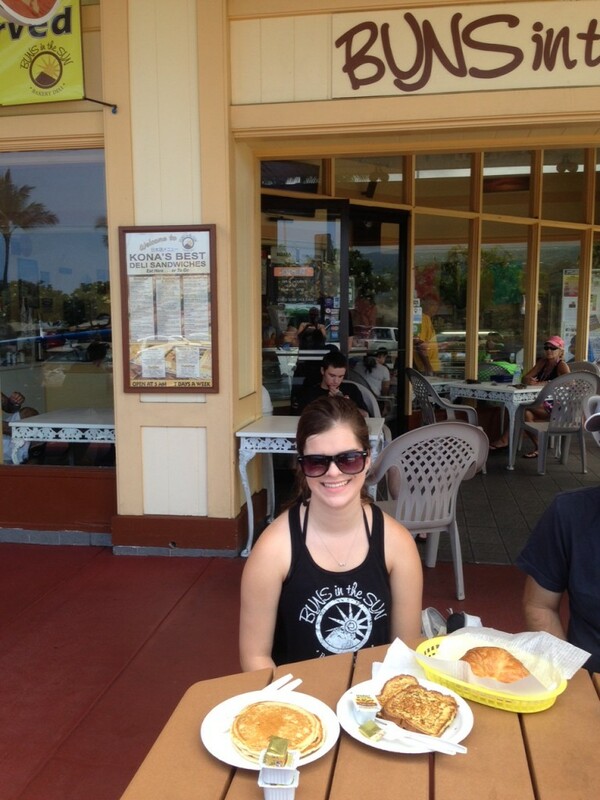 Buns in the Sun is a great casual place to eat on the Big Island. They offer breakfast all day including smoothies, breakfast sandwiches, pancakes with things like Mac nuts, bananas and chocolate chips, cinnamon swirl French toast, quiche, omelets and a tempting case of baked goods. They also have other options such as salads, sandwiches and an aloha bowl which is half a papaya filled with yogurt and homemade granola. You can buy bread by the loaf too. My brother loved the pancakes and my parents loved the croissant breakfast sandwich with egg and cheese (they were out of avocado both times we went). I decided to try the cinnamon roll from the array of treats in the case. It was large and was made from a light bread with, what tastes like, a cream cheese frosting on top. It wasn’t a gooey, moist cinnamon roll, but more like a lighter bread roll and a nice treat. I also decided to get a half order of the cinnamon swirl French toast. It came with two thin slices of French toast made from cinnamon swirl bread. The bread had a good amount of cinnamon and needs very little syrup as it was already sweet. We bought banana bread to go both times we visited and enjoyed it later. It was very good–moist and fresh. The service is pretty quick and the location, the corner end of a strip mall, was actually pretty nice. There is seating both inside and outside, although most of the seating is outside. It looks like a lot of locals enjoy this place. I recommend it for a nice variety of well prepared food at decent prices. Aloha! My family visited the big island of Hawaii and the first night we went to Kona Brewing Company, and we were not disappointed. When we pulled in it seemed industrial, but we were in for a pleasant surprise. We walked back and found nice outdoor seating in a tropical atmosphere with shaded tables. (There is indoor seating too.) There are a lot of lush tropical plants and palm trees. You may even spot a small gecko or two on the trees! While looking through The many menu options, the Kona Crab Cakes caught my eye. The two small cakes are full of crab and have a small spice to them. They came with an aioli and mango slaw. I would order them again. My mother ordered the Fish Tacos. They were three good sized tacos that were stuffed with large pieces of fish with a little bit of spice, black beans, corn, avocado aioli, and tomato. They were “spot on good fish tacos” according to my mom. I tasted them and I agree. My dad ordered the catch of the day which was Ahi served with rice and steamed vegetables. There was a sweet chili and lemongrass on the fish and it was delicious. My brother as per usual had the cheese pizza. The small was a good sized pizza with a fresh tomato sauce and tons of cheese. The crust was light and very good. For dessert we shared the Kilauea Lava Flow. It is a chocolate fudge brownie topped with macadamia nuts and locally made vanilla bean ice cream with whipped cream and a cute little cherry on top. Service was great.. Our drinks were refilled before they were half empty and everything was brought out quickly. Overall, the atmosphere and food made for a great evening.